Premier Houseboats are pleased to present this Humber keel on a residential mooring with cruising capabilities. 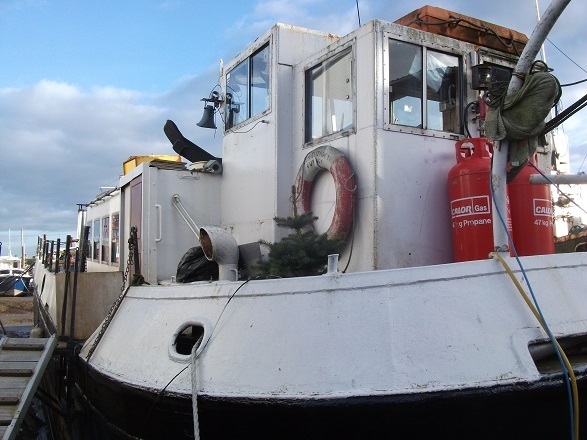 Ellen Elizabeth was originally purchased and brought to the areal from the Wandsworth Youth River Club in 2003, where it had been used as a training, adventure and leisure pursuit vessel. It comfortably accommodated up to 12 children plus crew, and between 1985 and 2003 it has carried over 10000 children, and obviously from a safety point of view was maintained to strict high standards. The boat has been extensively converted and offers accommodation on two levels. The upper level is a large kitchen area, with plenty of work space and storage, together with sink, oven and large fridge freezer. This area benefits from lots of natural light, and is a delightful area in which to work. Stairs lead down to a refurbished lounge, with a new wood and coal stove, and is a well decorated area with a new skylight for natural light. Leading from this is a large double bedroom, again with plenty of storage and well decorated. Through from this is a large shower room and toilet. Back from the lounge there is a corridor leading each side, one to a utility area with washing machine and tumble drier, the other to a second toilet, and a large storage area that could become another bedroom. Outside there is good clean deck space, and a wheelhouse with original equipment. The Lister engine, which has under 3000 hours, has been recently tested and run, and found to be in good working order. This Humber keel provides comfortable accommodation, and is a good size as a static or cruising houseboat, and has been converted to a good standard as a character home. Vessel name: M.V. Ellen Elizabeth Vessel condition: Good Vessel type: Humber Keel Builder: Thomas Dunston Year constructed: 1953 No. of engines: 1 Engine model: Lister HRW6M Fuel type: Diesel Fuel Consumption: 2 Gallons Per Hour Length over all: 65' Beam: 15' 6" Maximum draft: 4' 6" Bridge clearance: 13' 9" Hull material: Steel Hull type: Flat Displacement: 100 metric tons Fuel capacity: 300 Gallons Water capacity: 180 Gallons Disclaimer Premier Houseboats offers the details of this advert in good faith as it was presented by the seller or his representative but cannot guarantee or warrant the accuracy of this information nor warrant the condition of the described item within this advert. A buyer should instruct his agents, or his surveyors, to investigate such details as the buyer desires validated. The Item described within this advert is offered subject to prior sale, price change, or withdrawal without notice.